I've gotten many questions about how I grow out my nails and how I keep them long so here it is. These pictures below were taken in a span of seven months. They would be longer but I do file them down except for lately because I'm growing them out to eventually shape my nails into stilettos. 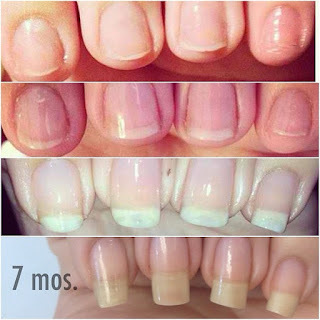 FAQs: How do I grow my nails out? What do you do to get your nails so long? My nails are weak how do I make them stronger? I’m a nail biter, any suggestions? 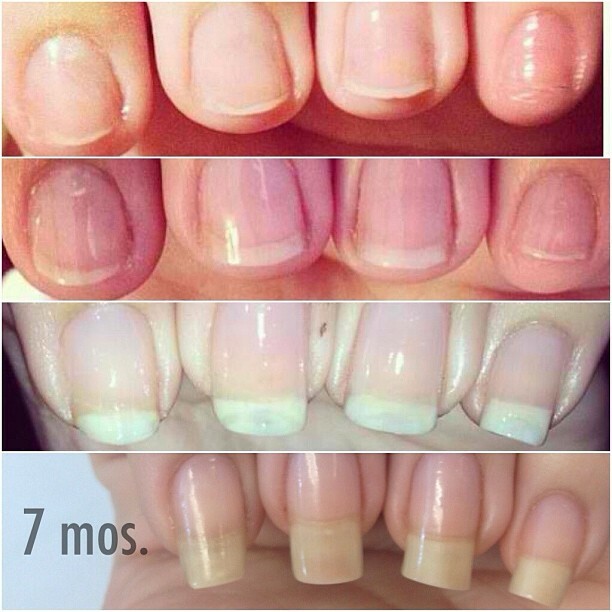 This is my nail length in a time frame of seven months. The first picture is right after I had taken off my acrylics after having them for over one year. I always got acrylics because I was a nail biter ADDICT. Not kidding. I could never grow my nails past my fingers without biting them off. I decided I liked nail art and had a nail polish addiction and got tired of having ghetto nails since I’d never take the time to get my nails done and they would grow out (gross). I used to use Nail Magic and that would make my nails grow so fast but I realized over time that my nails would still chip on the side. I do administrative work so my nails do still chip on the sides but it’s usually only my pointer finger. I stopped using nail magic and switched over to the amazing Lacquerloon suggestion (the long nail goddess), one coat of OPI’s “Original Nail Envy” and one coat of Essie’s “Grow Stronger” and it’s worked wonders (Thank you so much Gaby!). I apply it as my base coats every time I do a new mani or when my nails are naked. As for nail biting, once I started growing them out again I would ALWAYS have them painted, the more time it took me to do nail art the least I would want to ruin them. Hope that answered a few of your questions! If you have any other questions feel free to comment! And as always thank you for your support. which one do you do first? neil envy then grow stronger or the other way around?? Do you find that a few months after acrylics even though your nails are long they get thin at the tips and peel and start to break!?! ?